1. The terrible incident that happened at the Blue Marlin marina restaurant and pool on Friday, blogged about so movingly by Suburban at Other Oman. 2. The ROP now have 4 roaming RBT units. RBT stands for Random Breath Testing. The ANZO committee (who's ball is coming up in a few short weeks - super excited!) sent out an email to members this afternoon, and the story has been doing the rounds on various other email groups in town too. There is a ZERO tolerance level here for alcohol, so the concept of just one or two and I'll be fine is out the window - anything over 0.0 and you'll be having tea with the ROP. Not sure on what the penalty is for being found with alcohol in your breath, but hopefully some helpful person will comment it. 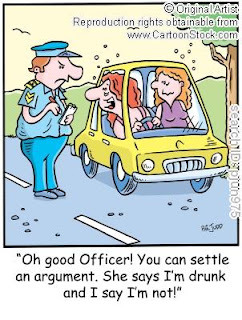 So just remember - don't drink and drive! You mean "la fin", I presume. Fair enough. Thank you for being polite about it. I've seen commenters on other blogs who wouldn't be so. Yaaaaaay! to the second topic that is..
People, there is no tolerance in Oman for DUI anymore..
A) the odds of my having ZERO blood alcohol are well... zero. B) They got the RBT kits for 18-30yr old Omani boys who drink and proceed to drive too fast like, well, 18-30 year old boys everywhere else. C) Be white, sensible and sober enough to get away with being respectful, and I think everything will be OK.
More hot air from ROP trying to justify their existence. The simple fact is road safety has got worse every consecutive year and there will be little progress as long as the ROP are involved. Actually, from speaking with a few people in town, the ROP have had breathalysers for some years, just typically, they haven't used them much. Dont be so quick to shoot the ROP, they are the police here, and need to be the ones enforcing this. Perhaps we'll start to see some movement on this growing problem of drink-driving now. We all know the story of the Omani man, the Porche, the Kiwi girl, and the Al Bustan Roundabout... it's a very real problem that needs to be addressed.